You are here: Home / burlap / Burlap Laundry Sign…How to! 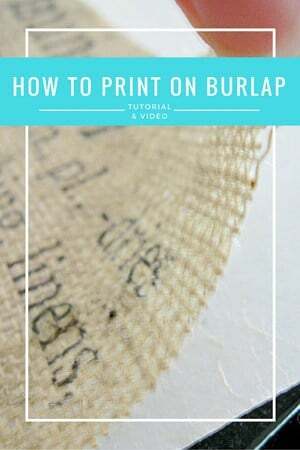 How to Print on Burlap eBook and Video Package! this is the eBook & Video Package for you! 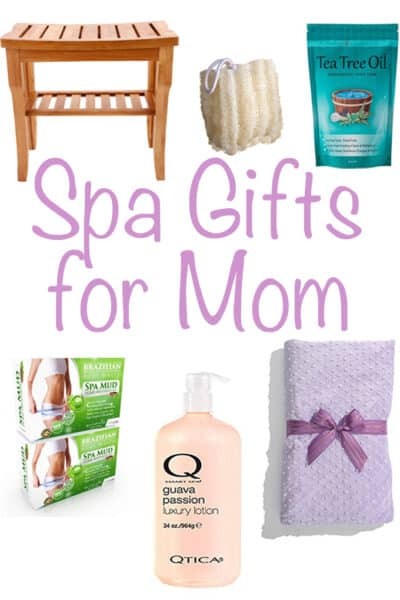 This makes a great gift & is perfect for Christmas! WHAT’S IN THE HOW TO PRINT ON VIDEO EBOOK & VIDEO? THE EBOOK WALKS YOU STEP-BY-STEP THROUGH THE PROCESS OF HOW TO PRINT ON BURLAP. YOU’LL GET A LIST OF THE SUPPLIES AND PRODUCTS I’VE USED TO CREATE BY BURLAP SIGNS. YOU’LL LEARN MY TIPS AND TRICKS. THE VIDEO GIVES A GREAT VISUAL AS I SHOW YOU MY TOOLS AND PROCESS STEP-BY-STEP! Don’t miss out while it’s only $4.99!!!! subject? ӏ’d bе very grateful if yyou ϲould elaborate ɑ little bit fᥙrther. Where did you purchase the roll of burlap in your video? Thanks for sharing your wonderful ideas! Am I correct that you put the original print on the top of your printer(glass part) then run the burlap thru with the freezer paper? You did a great job explaining everything, but how you got it copied. People like me who have Never done this before need all the help we can get. After printing…do you spray it with anything to keep it from brushing off? I printed some and when I rub it…it starts to rub off. I have bought sheets of laminated burlap at Walmart, and it works great! what is freezer paper and laminated burlap???? What type of printer was used:inkjet or laserpro? Hi~ I use a cheap Lexmark printer. I haven’t heard of anyone getting it to work with a laser printer. my burlap won’t go through my printer. What can I do to make it feed through without getting jammed? I have a roll of bamboo textured wall paper, I wonder if it will work on that? I have done this with canvas and linen. Thanks for the clear step by step directions!! I don’t know Julia ~ I bet it would look amazing if it works! Great tutorial – except I have a laser printer. From previous sad experience I know not to put anything but paper through it. :/ A few years ago I tried printing on freezer paper to do stencils and some of the freezer paper got stuck in the fuser and the duplexer was wrecked. Tried this on burlap it didn’t work well, I think the burlap was just to thick for my printer. Im going to try it on a flour sack dish towel I bet that will work . Thanks for the great idea . I am amazed…I tried this technique on thin fabric (cotton), and know it works well, but did not know it will work on burlap. Would you be so kind to share what font size did you use? has anyone tried it with a laser printer? Amazing! I love everything about this! I am wondering, what kind of printer did you use? Help! I’ve been trying this method for 2 days and it’s not working. It won’t feel through my printer. (Brother all in one bottom feed tray) I’ve tried freezer paper, iron on transfer paper, using sewing stabilizer, using my injet, my laser printer…..even bought a drop cloth to print on instead of burlap, until I opened the package and discovered it was plastic lined. I’m extremely crafty and handy and was excited for this new “easy” project. 2 days later, I’m frustrated, exhausted and have wasted 1/2 yard of burlap. Any advice?????? I ended up borrowing a friends Epson at their suggestion and it worked great. A few weeks later my old printer died and I needed a new one anyway. Bought a $50 Epson (Small-in-one) and it works great for burlap printing. Are you positive it’s freezer paper & not waxed paper??? I’ve never had an issue with freezer paper and I’ve been making them for years. I just did this and it worked the first time without any printer jamming! I did hold my breath and squinted the whole time it printed though. I designed it in Word (I’m not software savvy) and followed the instructions above and ran it through an HP Photosmart 7510 Inkjet printer. I originally did this on lighter burlap at the default normal setting and the ink smeared a bit. It gave it character, but I had darker burlap and changed the setting to best quality and tried it again. This time it came out much nicer. So go with a darker burlap. I have a laser printer, but it’s so sensitive I’m afraid to try it. So, burlap with freezer paper adhered will go through my printer?? I have an HP OfficeJet All-In-One. See reply 119…I have an HP Photosmart and it worked the very first time. This is absolutely amazing! I used it to print out stuff for my wedding to wrap around candle holders and it worked great!! Thanks so much!! It’s a wonderful craft idea, with so many variations! I adhered it to thicker quality paper, and tried to feed it through my inkjet Lexmark printer, but it wouldn’t feed and print. Perhaps, I’ll try attaching it to regular paper to see if that will feed.. This is a fabulous idea, thank you so much for the tutorial. I’ve seen tutorials that print a photograph onto tissue paper. Then you adhere the tissue paper to canvas. Do you think the burlap would take a photograph well? I love this and cannot wait to try it using the correct dimensions! I have linked this project up in one of our most recent posts … let’s just say my attempt at printing on burlap was VERY entertaining! I should have said I used an inkjet printer. I don’t know if laser would bleed or not. This is so cool! I tried it on osnaburg and it worked beautifully. I did a water test, and without heat setting it bled badly. Then I heat set it and it bled just a little. I’m going to keep experimenting. Amazing! What a great idea, but i’m afriad if I try to do this with my printer it will die. I have a hard time printing on regular paper. Lol! Thanks so much for sharing these instructions! This was very simple and easy to follow with great results! I used the idea of printing on burlap to make a really fun Christmas gift for my parents and for my in-laws. You can check it out on my blog. 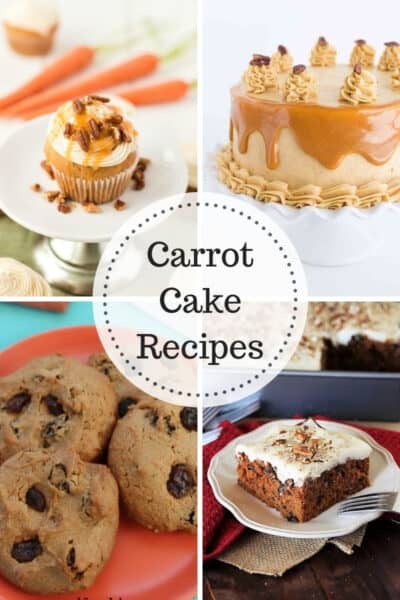 Hi Maryann, I like this tutorial (just as the rest of your site!) so much and yet..I have no idea what “freezer paper” is! My english is not good enough! Would anyone please help me out? The idea is great and I would l♥ve to try it! where can i buy freezer paper and this decorative burlap? Absolutely brilliant! I just love your little flowers! Thanks for taking the time to explain the process, I've been wanting to do something with my burlap for a year now…never seem to have the time or the right project for the time I do find. Now, to find this freezer paper you speak of…cheers! "Elegant Domesticity for Wayward Girls"
I love that! I've printed on fabric before, but I never thought something as bumpy as burlap would work. Very exciting! GENIUS!! So happy I found your blog this morning through Pinterest!! I love it!! This is so cool! Love it and I also love your verse on your heading!! Oooh! And could this also be done with thin corkboard, like you buy in a roll? WOW! This is outstanding! How genius are you?! One question though…Do you need to adjust anything on the printer to help the burlap run smoothly through the printer feed? Won't it get jammed and smear?! Thanks for such a grand idea!!! What a NEAT idea! 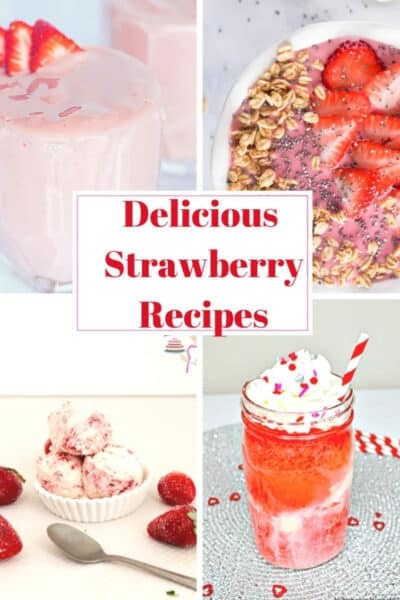 I'm loving your blog – and will be back to steal more ideas from you soon! Thanks for the spark of creativity you've given me! Aimees5 – I feed it though the top and it curves through to the front. It's a normal bubble jet style. Okay, so maybe this is a retarded question, but do you allow the burlap to "fee" through the printer or do you have a backdoor to open to feed it through straight? As far as printers go I am guessing it would have to be an inkjet, I have a Laser and since it heat sets the toner, I would be afraid the burlap burn and the wax would melt causing issues for the printer. Love the idea though!! I will have to go use my mom's inkjet if I decide I want to do it. Loved your sign so much that I had to make one too! Thanks for the inspiration! I love this laundry sign so much that I made a digital version!! And what's so funny is I did a Thanksgiving-definition version, and when I clicked over to your blog to get the link to give you credit, I found you had since done a Thanksgiving one too! The real thing is the best but until I can get to the store for some burlap, I have the next-best thing! Which printers this for work for I really can't answer… I'm not a printer expert. I've got a cheap bubble jet printer and it worked great. You want your burlap to be facing the direction it needs to in order to be printed on. In my printer my burlap was facing up in the printer tray… this is the side that gets printed on. Hope that helps! MY husband said " Better watch it, it's gonna JAMB, and mess up the printer" Ha Ha It worked like a charm, I will send you a picture of what I did. So cool. Incredible! I have been racking my brain on how to do something like this without outsourcing to a screen printer! So you put the fabric and freezer paper righ into the printer? Which side facing which direction? Is the printer supposed to print onto the paper side or the fabric directly? GET OUT! that's fabulous!!! thanks for sharing! I have always wondered how I could print on fabric. This is amazing! Thanks for showing us 🙂 It looks fabulous. Love this, but I'm too scared to try it. I don't know how I would explain to my husband that I ruined the printer trying to print on fabric. LOVE THIS!!! Thanks for sharing such a cute idea!! I love this. What a wonderful idea. Oh my! This will change my life I think!!! Crazy weekend and I am just now getting to this post in my reader! What a phenomenal idea!! Love it! Have to share on my FB page! Oh my gosh! I love this tutorial! I just picked up some freezer paper for another project but now I've got two! Love it! Thanks!!!! How cool is that! I had never heard of using wax paper and fabric to use in the printer. Amazing. I love the project. Thanks for sharing. Holy Crap! That is incredible!! I so want to try this. Thanks! I love it! Thanks for joining us for Anything Related! Love, love the idea!! 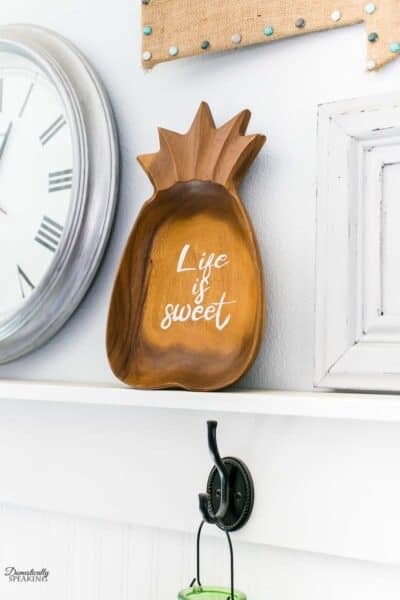 What a cute thing to hang in your laundry room. I am going to give it a try. This is sooo cute! Thank you for the tutorial. I hope to make something like this someday for my laundry room! This is really, really cool. Thanks so much for sharing! Wow, I had no idea that you could print on material. Thank you so much for sharing this information, I am going to try this out for sure!! This looks fabulous! Question…does the burlap dirty up the printer at all? My husband would die. Well the burlap I use sheds like mad. That is the first thing I thought of. And I don’t see a way to clean it out…canned air? How did it work out for anyone else? Oh my gosh I love this! Best idea of the day! And I have all the 'ingredients' for trying it. I have printed on fabric before but not burlap. Thank you for the inspiration! Whoa, I am SO going to try this. Thanks for the inspiration….printing on burlap, who knew?? So so cute! Great idea!!! You’ve iemprssed us all with that posting! I am NOT putting burlap in my 500.00 printer! I wonder if it only works with top feed printers. Lorrie ~ I ordered mine from Amazon, but I've heard Wal-Mart has it too. This is a fabulous idea! Now, where's the freezer paper? So terrifically cool and clever! I have to try this, and you've given me inspiration for so many ideas! Just wonderful. NOOO WAY!!! THAT IS SOOO COOL! Thanks for sharing.. so many great ideas I have to try. What a fantastic craft! It looks great. Great sign. 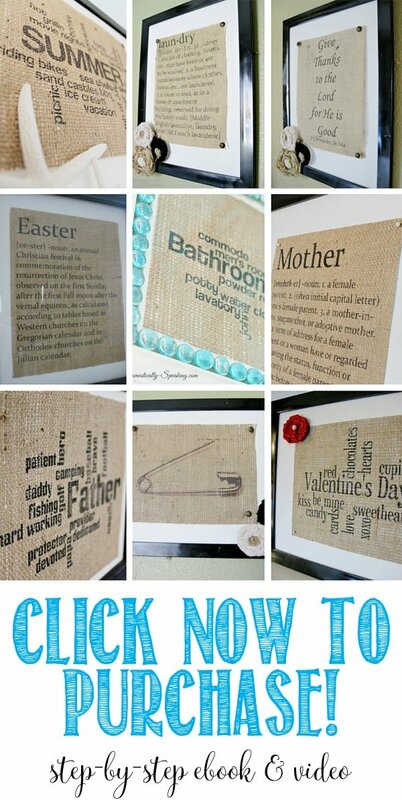 Love burlap and that is such a cute idea. Now if I could just start making things like that. I LOVE this idea. I had no idea you could put fabric through a printer. I'd be so worried it would jam! I love how yours turned out though and am going to have to get up the nerve to try this sometime soon! Awesome! 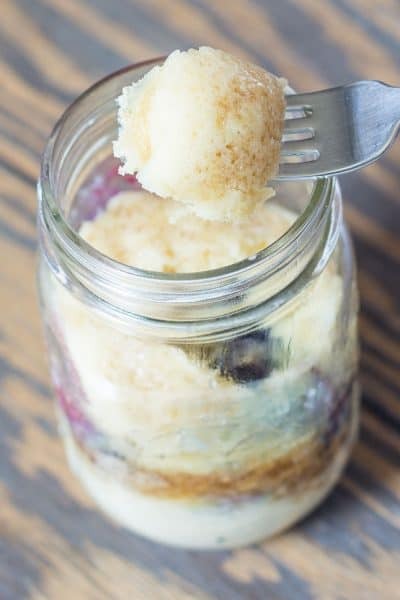 You could use this technique for so many different things! Ohhh…this is awesome! I just adore your burlap "laundry" sign! Love the pretty burlap flowers that you added as well! You also did a great job with the tutorial! I think I could actually craft one of these beautiful signs! Thank you for sharing this with us today! VERY COOL!! Thanks for all the detail on trying this…i am going to have to give this a try! That is a terrific tutorial and I LOVE that sign! Clever, clever, clever! Looks great! Very neat idea. I wonder what printers it will and will not work in??? Love it Maryann, thanks for the tutorial. I am needing to try this. Yes, needing! Thanks for the how-to…I've been wanting to try this, but really wasn't sure how to go about it. Your laundry room must look AMAZING! That's a really clever project! Freezer paper can be used to get candle wax and melted crayons up too. It works kind of like transfer paper does. What a fabulous idea! I have 2 yards of burlap that I have been clueless as what to do with it. Now I know!! Visiting from Tatertots and Jello. I think I like yours better! Thanks for sharing … I've posted a link. I am in love!!! You need to post this on Funky Junk Interiors she is having a "what can you do with burlap party!" I would be afraid that all the burlap lent would mess up my printer. I may have to try this tho! Wonderful idea!!! Use some compressed air to clean out any dust/burlap lint out of your printer. What a great addition to a laundry room. Very clever to print on burlap. Are you kidding me?! Wow- what a fantastic idea and the end product screams Ballard Desighns or somethplace great! You are amazing! Awesome! I absolutely love this! DYING!!! I want to make this with "Love" for my master bedroom. 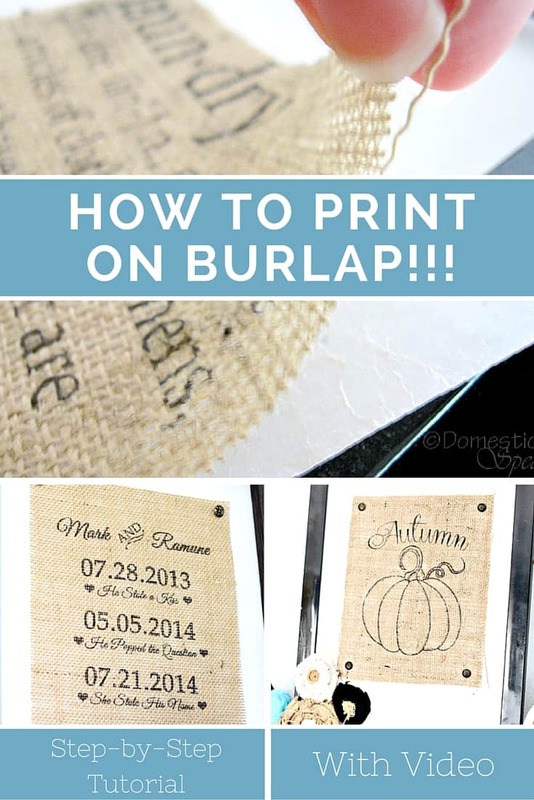 I love this–I have printed on muslin but never thought of using burlap! That is so very cool!!! I love it and how easy!! Thank you for posting this!!! Wow, that is awesome!! Great project! That is so cute. Didn't know you could do that. Must try it! I love it! I am slowly redoing this house one room at the time… My laundry room needs it SO badly… It's huge, but it's a MESS! I would be embarrassed to even show a picture! Maybe if I made a cute sign like yours I'd find some motivation to make the rest of it cute! Fabulous technique!! Thank you so much for sharing this project how to. Wow! this is cool! I am actually going to try this! Very well done! Amazingly wonderful!! I have to do this! Very cool Maryann! What can't freezer paper do??? Wow, that is really cool! Must try the wax paper tip. Thanks for sharing! Not wax paper it is freezer paper. That looks so fantastic! I love it!! Easy, peasy! Who knew? What a great tutorial! And the finished project is wonderful. I am starting a new meme within a couple of weeks, Tutorials, Tips and Tidbits. This would be a perfect entry! Please join StoneGable with this wonderful project. Wowee! I LOVE, LOVE, LOVE this idea. I'm so inpsired by all the possibilities it holds. And what a GREAT tutorial!